Nose: peaty, earthy, lemony. Some sulphur notes. Palate: citrus, then becomes more sweet and smoky. Finish: soot and peat. Quite long. Maybe not a competition for best Islayers, but very good whisky indeed. I picked up a bottle of this on a whim because it was very cheap and I've tried some Springbank before and loved it. It was a really interesting dram. There was so much going on in the nose and palate here that it was hard to figure out where it was going, a real sensory adventure. I think a lot of people would like to know where very cheap Longrow CV is still to be found! I had picked up a bottle of this, now discontinued, peated expression a few years ago. Having decided I wasn't ready at the time to savor it's charms I let it grace my shelf all this while. Until last night, that is. I have always been fascinated by Campbeltown expressions, especially the stuff that comes out of Sprinbank. They produce three expressions the year round. The unpeated Hazelburn, the lightly peated Springbank and the 'heavily' (by Campbeltown standards) peated Longrow. For me it was a case of irrational fascination followed by a realization that these flavors were something I could really sink my teeth into. Because the Longrow can take some getting used to I tell you. But when you do it's oh so worth it. The CV (for Curriculum Vitae - yes, you read that right) is Springbank Distilleries' way of introducing consumers to the different flavor profiles that they represent. So in the case of this Longrow the spirit inside the bottle comprises of three different vintages and four types of oak. Nose: Mild peat. Lemon. Orange sweets. Hint of salt. Sweet caramel. Touch of sulphur - enough to be noticed and not enough to cause pain. Grass. Greens. Rice pudding. Husk. Cereal. Cardboard. Golden syrup. Black sesame creme brulee. It's a controlled nose. I like it. I like how it journeys from mildly sweet on the nose to savory on the palate and finally quite charred on the finish. Tells me that the spirit is complex and successfully draws from it's so many influences. This has now been replaced by the NAS Longrow Peated which I haven't had a gander at. Various opinions tell this was not a happy change but I won't comment on that until I. pick one up for my self. Till then I'm quite happy to have this one sitting uncorked on my shelf. Very nice review! Longrow CV is some great stuff. I found the whisky actually got better the more I emptied the bottle. I can still get it at a local shop as they have a few still on the shelf. I know one day I'm going to go in there and see only one left at which I'll have to buy it. I am not a fan of Campbeltown but I would like to become one. I found that they have a very unique signature, but I don't know if I was unlucky but there was always a wrong note that prevented me from really enjoying my dram. This sourish herbal note could be enjoyable in the background but is, for me, very annoying when it comes forward. I had a Springbank where it was like some rotten herbs. Yeurk! So I was a bit anxious with this Longrow CV. Fortunately, that was for no reason. The nose. First I was hit by the petroleum, then come the sourish herbal note that I associate to Campbeltown but with enough sweet to keep it in stand. So I keep nosing it and I have vanilla and a lot of hay. The palate comes with a lot more sweet and I find the same pecan I had with Hazelburn but this time with the peat (petroleum) and a little salt at the end. If you keep it for 30 sec in the mouth, the smoke is progressively taking charge and bring new flavours like a malt with sherry notes as if there was a drop of Lagavulin 16 in the background. The finish bring back the petroleum and the hay. Again, if you keep it longer before swalling it, the finish will be a lot more complex. The balance is fairly good. I would not let it breathe because that brings out the sourish herbal; on the other hand, this is one of the whisky that benefit most of a good time on the tongue. @Benancio I am not glad to know that I am not the only one to get that sour herbal note, but I am reassured about my tasting abilities. Those reviews of Springbank were so great, it was a big disappointment for me. I do have an hypothesis about the cause but it is not an educated guess since I have never visited a distillery. You will let me know if I am within the scope. I thing it may have to do with the freshness of the peat. If the peat is piled before being used, it may formed cavities with moisture where decomposition may formed therefore some rotten tastes. So what do you think? @Robert99. I've had a few bottles of BAD scotch that had the same sour herbal taste. The last one was a 2011 or 2012 bottle of Bunnahabhain 12y. I have my idea what the cause is. Bad casks , rotted or contaminated staves. I visited several bourbon distilleries in Kentucky and I saw mountains of empty barrels in fields behind the bottling building. These barrels are disassembled and shipped to Scotland where the coopers there reassemble them. If the distillery or cooper don't care, BAD staves are used and these barrels contaminate the whiskey. I have no proof although if you see empty bourbon barrels in a field in the rain in the mud, it makes you wonder. If there is any truth to this, it's a crime to waste good whiskey with something that is preventable. If the cooper sees any suspect staves throw them away. I saw plenty of old barrels Forsale that looked and smelled awful. What do you think the cause of the sour herbal tastes in these bad bottles? The nose on this blows me away every time. Raise the percentage add some ambergris and bingo, aftershave! In terms of bang for your buck this malt is my No. 1 recommendation. Nose: Peat smoke, pine resin, creosote, molasses, cocoa, liquorish. One of my favourite smells. Taste: Full bodied with lots of attack, pine needles, resin, peat smoke. Like a Christmas tree on fire. Finish: Short and sweet after the main fireworks. I love the tagline on this one. I feel a bit sad that this scotch is fading into the yester'sphere. It grew on me over time. Parting is such peaty sorrow. Nose--Grass fire, hay, reptile musk, lovely hint of peat, virgin olive oil, ash, peppermint. Palate--A very unconventional exchange: Lemon, pan fried rattle snake, mesquite smoke, anejo tequila, mescal, peaty goodness. Finish--The oily and the spicy intertwine and then release with lingering peat and smoke, with a touch of oaken wood in there. METAPHORICAL MUSINGS & MARGINALIA This whisky is a bit strange, although I have tasted tequila-like and/or mescal-like influences in other whiskies from time to time. Such overtones are not unheard of, certainly, but rare all the same. The way tequila interacts with oak is different than the way scotch does--usually. In this case, with such a relatively young whisky that shouldn't have any wood flavor in it, there is some. Why? How? What? I have to speculate that Springbank mixed in few funky oldish casks into the CV, along with a decidedly young Longrow. The grotty, sugary youth and burn is in there, but it has been mellowed by something that is magically unique and yet deliciously grimy, all the same. Is the new white labeled Longrow Peated more consistent, producing a more expected end on the taste buds? Yes, I should think so . . . and yet . . . sometimes the unexpected is worth trying, or even becoming accustomed to. Over the past year, I have gone back a few times to the Longrow CV with better and better results. Like Oliver Onions' "beckoning fair one" of gothic literaria, L-Row CV has intoned my name through long, dark corridors of the soul. Did I answer this Dark Passenger, you ask? Hell, no. Never provoke a ghost, or a sociopathic scotch. If anyone sees you whispering into your glass, there's always the chance you could find yourself locked in a safe house with padded walls and nutters for company. Suffice it to say that Longrow CV has an ethereal quality best appreciated without too much fuss and bother. It is an eerily strange dram, the sensory trappings of which might have been somewhat passable one hundred years ago, or might still be hundred years into the future . . . a Customer in Black, it is, that sits quietly in the corner of the pub, brooding like, sipping, brooding some more . . . that CIB SOB who comes in late when nobody seems to be watching, orders his drink from the bartender (who can't seem to recall serving him) and then somehow disappears right before last call, leaving the door open behind him, and his empty glass on the table. In the case of the CV, I wish I had carried on a conversation with this "weird peat-head in the corner" . . . alas, it is gone, never to be purchased again. Hear, hear: "The Longrow is dead, long live the Longrow." In my review, I speak of the taste of a reptile as well as the scent. As a young lad I handled more than my share of snakes. Garter snakes usually stunk to high heaven, but other varieties had a similar type of oil and that is what I'm talking about. Mezcal and tequila do move a bit in that general direction but the CV has a lovely grottiness that is hard to pinpoint and so I used the reptile musk since that is what I was reminded of. I lived in an area with red clay soil and that also was carried on the snake's bellies. The oils help snakes to stay relatively clean despite crawling on their bellies. You can smell the scent in the reptile part of a zoo. It's there as well. In very low amounts it can be charming. As for the taste of pan fried rattle snake that is quite different than the scent of a live one. I was attacked by a rattle snake outside of Cody Wyoming when I was a lad between sixth and seventh grades in school. My foreman at the ranch chopped off the head of the snake and gave me the rattle as a souvenier. It wasn't a very big snake and so the venom would have been quite dangerous had I been bitten. I encourage you to try rattlesnake if the opportunity ever presents itself. It is a very delicious meat indeed. Thankfully, I have one CV left. I will save it for some time before popping that cork. I see you like the IB Ledaigs. I'm intrigued by this bottle. A friend is traveling to Scotland and I might have this bottle shipped to his hotel. I live in Portland, Oregon, USA. Another bottle that intrigues me because it may be a bit like the old Clynelishes/Broras is this one: www.thewhiskyexchange.com/P-24356.aspx It will be up shortly. W.E. just acquired it and they are putting it up for sale. Tasting notes up soon. Suffice it to say, I predict it will be lemony, farmy (manure, wet muddy pastures), with some cream, mustard, and a little industrial pique (acetone?). Just a guess. Taste: Very sweet peat on the fore, but with salt, peat, earth, and lemon on the back. Finish: Huge peaty smoky finish with tons of wet steaming earth and mulch. It is like a hot humid day watching the steam rising from the mulch, and fresh steaming over turned earth. Certainly a long finish. There is some tar and rubber tire at the end, but that is the first I saw of it. Balance, Complexity: I would say a wonderfully balanced peat monster. It has the peat and smoke along with some complexity to match. Certainly better then many other inexpensive peated youngsters. Color, Body, Aesthetic experience: Same light gold as the other three. Almost indistinguishable from the Springbank. As I said before I love the Cambeltown thing (ncf/no coloring/ high ABV). Wish there were more expressions of this stuff that were affordable. This is probably the most affordable peat monsters outside of Islay (and one of the tastiest). Conclusion: I really liked this bottle. Easily the best thing I have tried from Springbank (not saying much). I hear it is one of the peatiest Longrows that has been put out . . . which makes me sad. I also hear it has been discontinued (I hope that is wrong) and in its place is a new white label bottle simply titled “Longrow.” Not sure if it is suppose to be the same thing or not. Either way, I hope to pick up a bottle of the CV before it is gone. This is a case where I wish we were both drinking from the same bottle. I know and trust your taste enough that if you say something was funky then I believe it was funky. Mine, I assure you, was not funky or disgusting. It was every bit of an 87 if not a notch or two higher. And of course you are correct to remind me of your sister's Alchemist. I believe we tried the Port Charlotte first - which I remember liking even more! It was simply that the Springbank with the Port finish was so very un-Springbank-ish. I actually forget that it was Springbank! And I would love to retaste it at some point just to verify my "enjoyment" ;) And I am quite sure it rated above 87 in my book. That said, I would really like to find a standard expression from Springbank that I can support, get behind, and buy. I love their philosophy and their commitment to keeping everything on site and old school (from malting to bottling). I completely agree on both counts. While it is psychologically distressing to disagree - especially about a whisky you are "supposed" to agree on - I think it keeps people from falling into the fallacy that there is an objective experience for a given whisky bottle. For me that is the excitement! I find a whisky I am excited by, and of course I want my friends to agree. Sometimes that happens; sometimes it doesn't. As you get to know your friends taste there is a greater degree of predictability. Still, you never quite know. The only thing I can offer is my own honest opinion and experiences - subjective and biased as they may be. And the only thing I hope for are the honest opinions of friends. And I do believe that reading reviews from you and others helps me to continue to develop my own understanding of my subjective tasting experiences. My hope is to better explain and translate my own tasting experience into written form. First distilled in 1973, Longrow is a double distilled, heavily peated single malt and its my first Campbelltown Scotch! The barley used in the production of Longrow is entirely peat dried. The full production line, from barley to bottle, is done by Springbank distillery and only local barley is used. They even still use coalfire to heat the copper stills. Longrow CV is the latest addition to the range, complementing the existing 10 and 14 year old bottlings. Appearance: greenish orichalcum:p while turning the glass, a razorsharp edge appears and very slow legs follow. Seems like quality stuff. with water: bit more vanilla, chamomile, freshly baked bread into roasted nuts and more flowers and wet grass, cannabis? and then the sweet buttery barley comes back... its a little wild at first meeting but it it keeps evolving as it goes sweeter and gentler, I get some white wine too, and then it goes into coastal smells again and motoroil... :p Its a real sniffer and it takes a few drams to figure out, its complex! Finish: Long! a gentle,warm kick coming down, wood bitters, smokey dryness, green peat, creamy barley, salt and finally some iodine:) The finish kind of summarizes the main flavors in the whisky. This, for me, is just the right whisky at the right time. Its a bit mysterious; every time I put it to my nose or in my mouth I get something different. Because of different casks and the varying age of the whiskies used, you not only get the young, feisty green Ardbeg-ish notes, but also the complexity from the older casks used. Wonderful, Fantastic, Great, Genuine class product. If you like complex, peaty, traditional ánd affordable Scotch, get it! Goes very well with a light cigar too. Cant wait to get more from Springbank. Expedition Campbelltown is on! Tasted a glass of the CV tonight at the pub. It is perhaps a flawed dram in terms of the way all of the elements comingle in the glass, but I was charmed by it. The smoke is quite nice and I was surprised that I enjoyed the tequila-like overtones. Yes, they are in the dram, but they don't overpower. Neither was I off-put by the phantom hint of rubber, which is very minor and not any sort of problem to me. It is so minor, in fact, that I shall not list it in my tasting notes. Nose: Grass fire, hay, reptile musk, lovely hint of peat, virgin olive oil, ash, peppermint. Palate: A very unconventional exchange: Lemon, pan fried rattle snake, mesquite smoke, sea salt caramel, anejo tequila, mescal, peaty goodness. Finish: The oily and the spicy intertwine and then release with lingering peat and smoke, with a touch of oaken wood in there. This whisky is very strange, although I have tasted tequila-like and/or mescal-like influences in other whiskies from time to time. Such overtones are not unheard of, certainly, but rare all the same. As a result of the glass I tasted at the pub, I have managed to acquire a bottle of this whisky even though it is hard to come by where I live. The Longrow CV is not something I would stockpile, certainly, but one bottle is a welcome and eccentric change. For me, it is the elusive "reptile" of whiskies. LCV may not be the "lizard king" as such, and it may not be able to do "anything," as Jim Morrison once crooned, but it is nonetheless charismatically cunning in its reptilian ability to charm the receptorssssss of sssssome humanssssss, like myself. I find this whisky to the be, in many respects, the anti-thesis of most bourbons, which are sharp where this is dull, sweet where this is spicy, and high where this is low. Be this as it may, there are some herbal notes in the LCV, such as peppermint, that are certainly also present in some very good bourbons. I have yet to taste the HIgh West Campfire, however. With that, I suspect all bets are off. I was surprised to see that my score was the same as the average score. That rarely happens. When it does, I can't help feeling happy. I have no idea why. I guess it's the innate desire among humans to agree with each other and generally to be agreeable. I picked up a bottle of this after Christmas as it is on the way out (in the CV format) in Ontario. Your review seems to further confirm that this one is right up my alley of enjoying bottles with unusual and/or intense profiles. I can't wait to try it, as I will be cracking this one open in less than a month. Springbank distillery is located on the southern Kintyre peninsula and produces three distinct types of single malt: Springbank, Longrow and Hazelburn. Springbank is lightly smoky, Longrow is very smoky and Hazelburn is not smoky at all. The Longrow CV version was first released in 2008 and, as is the case with the Springbank CV and Hazelburn CV, the “CV” stands for “Curriculum Vitae” since - according to Springbank's Kate Wright - "it contains whiskies of a variety of ages...". Longrow CV is a vatting of 6, 10, and 14 year-old malts, each aged in different types of casks. The nose is distinctly peaty and quite fruity with apples and vanilla. There is also a grassy element to it. I had not expected the amount of peatiness but, frankly, this is very good. The palate is smooth and peppery at the same time, astonishingly peppery in fact. There is the vanilla again, this time hand in hand with lemon notes. This is not overly complex but hugely enjoyable nevertheless. The finish is long and peaty, with some ginger notes right at the end. I was very pleased with this whisky. Although not very complex I felt captivated by the very distinct peatiness and the underlying sweetness. In fact this tasted so good that I did not even try it with water. A great single malt and very good value for your money. I will have a chance to pick up this bottle when my girlfriend travels to another state. It is unavailable in Oregon. I take it you recommend it highly? I do like subtler smoky/peaty savory drams other than the Islas. This one seems like a rare opportunity. Thank you for your helpful review. @rigmorole, tell us more about your girlfriend. You mentioned her in a few responses. After reading all of the glowing reviews, and seeing it had a comfortable $50.00 price point, I decided to give this a go. And am I ever glad I did. Not because it is a new favorite...It is not. But because I finally understand what peat is. The smell on this whisky is straight up quality Mezcal. If you have ever had Del Maguey Mezcal, you know this to be true. I got some of this aroma from Bruichladdich An Turas Mor. I wrote it off as "buttery" because I had not made the connection that this was what peat smelled like. But wait a minute. I have had multiple expressions of Laphroaig. Several Ardbegs. Lagavulins and Taliskers. Aren't they all heavily peated whiskies? Why had I not picked up this aroma on them? I have no idea. They all tasted coastal: briney, salty. Iodine, medicinal, smokey. Not this. This is Mezcal. This is vegetal. This is fusal. Is this, actually, PEAT??? Anyway, once I get under that aroma, there is some buried sherry sweetness, and a bit more of the iodine-like burn that I associate with Islay whiskies. The finish is moderate. I still cannot get over the idea that I am drinking Mezcal. I have poured a glass of Del Maguey Crema RIGHT NOW. I am drinking them side by side. RIGHT NOW. And brother, were it not for appearance, I could no tell you which was which. If anything, the Mezcal is fruitier, sweeter, fresher, and the Whisky drier and more subtle. If I did not know better, and had these side by side, I would have thought the CV an Anjeo version of the Del Maguey Crema. So, wow. A revealing whisky for me. Lots of people here really like this one. For me, it is not a repeat purchase. I do not slam it in the rating because it is simply a taste that does not appeal to me when I want scotch. There is no defect, it is not poorly made, so I sill not grade it as such. I guess what I am saying is that in my book, an 85 is a good whisky, a well made whisky, but not one that I would buy again. There are too many that I regard and rate higher. It is a very unique taste. Have you had the Compass Box Flaming Heart 2012? Very similar. If you like that, this is a more focused version of that vegetal / mezcal peat taste. I prefer the peat of the Laphroaig, Ardbeg, Lagavulin variety. More briney, medicinal, and smokey. Hope that helps! Nice review, peat is indeed a strange creature, manifesting itself differently in almost every peated whisky you find. Some impart smokiness, others an earthiness or herbaceous tang, sometimes bitter or sour, sometimes smooth, sometimes harsh. Your review makes me want to try Mezcal. At least after Ralfy's little sidetrack on Tequila, Mezcal and Sotol on Youtube I now know a little about that stuff which I would not have taken the time to explore otherwise. I have a bottle of Longrow CV on hand which I will be opening very soon, I wonder what peaty adventure awaits me there, according to my taste buds? I guess I'll be posting a full review in about 4 months after I've done my usual time course (and random) sampling. Cheers. 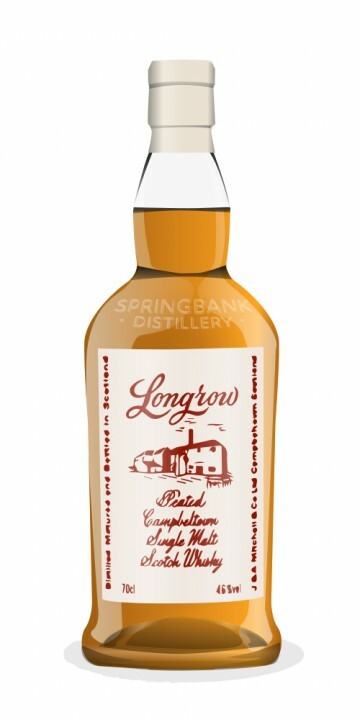 Springbank Longrow CV was recently recommended to me and I like it, a LOT! I think the nose is its strongest feature. Smoke and peat but not like Ardbeg, much more grassy and yet coastal. Don't add water! I did and I didn't like it as much. There is an almost lemony nose to it as well. The taste is spicy and oily with smoky peat and a bit of heat sitting at the front of the tongue. As good as it tastes it does smell better. It finishes dry and peaty with some spice. I'm happy with the finish and balance but I could honestly just nose this whisky all night, never drinking it and still be very satisfied. Great review. I had a bottle that I bought in Ontario after Whisky Live 2010 and really loved it. Your review is very accurate! the teview above is so accurate. i love this whisky also one of my top 3. love it. Longrow is the heavily peated whisky from the Springbank distillery on Mull of Kintyre. This Longrow CV has no age statement, but apparently consists of 3 types of whisky: a 6 year old bourbon cask, a 10 year old port and rum cask and a 14 year old sherry cask. The CV is rumoured to stand for Curriculum Vitae (although Springbank’s Jenny told us it meant Chairman’s Vat). Be that as it may, this bottling was clearly meant to show off the different characters Longrow can produce. It was first released in 1973, but my bottle dates from 2010. The nose offers sweet peat, working in harmony with vanilla and yellow apples. A touch of wine gums and some silt. Very creamy and peppery. It becomes much more assertive on the palate. Again fruity, but now with a lot more citrus and the white pepper puts its foot down. Nice sweet peat, again. A lot of ginger. Less outspoken salty. Not very complex, but very quaffable. The finish on oak and ginger, might have lingered a bit longer in my opinion. This is a wonderfully balanced, young whisky with a wonderful profile. Very affordable. Sweet honey on the tip of the tongue furthers the intrigue, but then, look out…the onset of earthy malt and smoked peat severely changes up the plan; now, we’re on the coast, and it’s getting choppy indeed; the balance that appears a tad lopsided on first pull due to the contrast between the top end honey and the bottom end malt makes more sense in time, especially in the glow of the intense, eye-crossing second half. The finish is of oak, malt, and seaweed, and has its foot on the neck of the sweetness for good measure. "… the oldest independent family owned distillery in Scotland. Founded in 1828 on the site of Archibald Mitchell’s illicit still, the Springbank Distillery is now in the hands of his great great great grand son, Hedley G. Wright. Owned by Mr Wright’s J&A Mitchell & Co Ltd, Springbank is the only distillery in Scotland to carry out the full production process on the one site. 100% of the traditional floor malting, maturation and bottling is done at the distillery in Campbeltown. It produces the most hand made whisky in Scotland, with traditional production methods being used throughout the process, and human involvement at each and every stage." And it was all you’d expect of a independent operation: full of character and charm. As an aside, TV Food and Drink connoisseur, Oz Clarke, actually visited the same distillery a few days after we went there, and I was rather chuffed to see it again on the TV. Longrow is one of three whiskies distilled at Springbank (the other two being Springbank and Hazelburn), and this is the heavily peated single malt they produce. So, the Longrow CV, then, which was the one we tasted in the shop as part of the tour. On the nose: a whiff of the harbour, gentle coal fires, something buttery and syrupy there, too, and with the faintest touch of Pernod. The peat hits on the mouth in the most silky of ways; that butter is still there, a little creamier. Medicinal, perhaps, but not quite like the Laphroaig 10. A warming, peppery spice. The smoke stays with you afterwards, certainly, but it never dominates the experience. All in all, a very nice dram – especially for £30. It’s just the kind of thing to have when you can’t quite look an Ardbeg in the eye, and you could easily mistake this for one of the finer Islay malts. Thanks, guys! I've seen the CV do well in the Jim Murray Whisky Bible, but that's about it. As for Oz - to be honest, I can't remember the precise details, but I seem to remember him really liking it and everything about the distillery (as it's rather traditional). DBK - ah, I see - good reviews! Gaig - great stuff. I really want to try some of the other offerings from the distillery. Depending on your source, Campbeltown is one of the major regions of Scotland. Longrow CV is distilled by the Springbank distillery in Campbeltown, which lies near the tip of a southwestern peninsula of Scotland named the Mull of Kintyre. According to the distiller’s notes, in the 1800s there were at least 37 distilleries in Campbeltown, but now there are only three (Springbank, Glen Scotia and Glengyle). For orientation, the island just to the west is Islay, which is the home of the notorious and popular peated whiskies. Longrow whisky was first distilled in 1973, as an experiment to see if they could produce an Islay-style whisky in Campbeltown. Longrow currently has a 10 and 14 year offering, with CV as the latest edition. CV stands for Curriculum Vitae, which in Europe refers to a summary of ones significant work experience, and which somehow also refers to a blend of Longrow whiskies of various ages. Springbank used to offer a CV … because they lacked a mid-range, they just mixed the young and old together. Color: I usually do not comment on color, but Longrow, as with its sibling Springbank, is a golden yellow, accented with an olive greenish tint … resulting in a somewhat light olive oil or motor oil interpretation. This off-color is ultimately mysterious and alluring, and indeed boosts the Longrow experience. And finally, there is no extra coloring added and it is not chill-filtered. Bottle Nose: Like steam escaping from a pressurized tank, removing the cork releases a captivating bouquet of essences of oily peat, glue, rubber, brine, marzipan, banana, and caramel. This is already quite a lot to deal with. Glass Nose: A more subtle sweet, fruity, briny, peatiness. This is not of a smoky character, but rather the sweet, aromatic, peaty essence of Springbank. Water had no effect for this review. Palate: There is a deep oily texture that delivers an engaging rich and creamy, sweet and peaty brininess, along with some cinnamon, spice and sweet almonds. There is so much going on here, that you really should allocate a bit of extra time to ponder and contemplate this experience. Finish: Medium, nicely warm, a bit spicy, slightly drying and satisfying … a wrap-up of the engaging complexity you just encountered. Conclusion: Longrow CV is neither a fine, elegant nor reserved whisky, but rather it is engaging, intriguing, complex, colorful, flavorful and memorable. Longrow is gregarious, and more fun than most of its neighbors from Islay. This is a colorful, folksy and happy whisky, and while the fine popular Islays have a place in my cabinet, they are usually quite one-dimensional and reserved compared to Longrow (I was going to say “boring”, but I didn’t). The peaty character of Longrow (and Springbank) is that of a sweet sulphur, rubber and maybe bacon character, as compared to the Islay fire pit smoke (in my opinion). This is not fireplace, road tar, auto shop or seaweed, but rather an intertwined sweet, briny and peaty composition with numerous flavor harmonics. If you like Springbank, you may like Longrow CV even more. And, to share with you, the west highland trio, that I have recently been pleasantly enjoying, you need to have Springbank 10, then Longrow CV, and finally Ledaig 10 (from Mull, just up the sea). These all seem to share the same genes with increasing levels of depth and intensity. And, too bad my Jura Superstition and Bruichladdich Rocks are all gone, as they would somewhere belong in this picture as well. I also plan to soon publish a review of Ledaig 10 … hopefully before that bottle is gone ! Score 92/100 in this peated, non-wine-finished category. Lovely review, @AboutChoice! I agree wholeheartedly with your assessment of this delightful whisky. Twice distilled, unlike Springbank’s 2.5 (or, really, 2.8) and Hazelburn’s thrice distilled, Longrow is the more heavily peated of the Springbank brands of Scotch malt whisky. The CV expression—CV meaning ‘Curriculum Vitae’—is meant to represent the style and range of the various Longrow expressions, though how ‘representative’ it is comes down to the choices made by the blender, of course. Upon opening the bottle and pouring my first few drams, I found a touch of burnt rubber and something slightly metallic on the nose, but thankfully these both faded quickly and have not reemerged. Instead, I find that wonderful, milky Springbank malt, reminiscent of rice pudding, alongside salt, peat, ginger, vanilla, coconut, cherries, and raisins. It is sulfured, but—and I want to stress this—only mildly so. The palate is sweet, round, and a touch spicy. It is again malty, with notes of ash, campfire smoke, salt, marshmallow, coconut, and light sherry sweetness. Cocoa rounds out the finish nicely. The Longrow CV is yet another solid offering from Springbank. Thank you for a very informative review. Your comments about the level of peat got me thinking...while I know that I like peat, I am trying to make my initial set of SMSW purchases in a progressive manner, relative to complexity in order to develop my palate properly. In that respect, is the Springhill 10 an easier/simpler dram than the Longrow CV, for the purposes of making a first "Campbeltown" purchase? @dbk, I always anticipate your edifying facts and attention to detail ... yes I forgot to mention Hazelburn in my review of Longrow CV, and that Springbank is distilled 2.8 times ! Very interesting whisky this... I've bought a 20cl bottle, poured a measure and allowed it to settle. On the nose I'm getting a light woody smoke, white pepper with citrus notes, light honey and sea spray. The arrival is very subtle, watermelon, apple then light peat and then an unexpected full smoke and peat explosion finishing with a surprisingly long ginger, and woody-peppery tingling burn in the mouth with citrus after taste. Light ginger, pepper and honey-citrus. As a Springbank fan I didn't know quite what to expect from this stable mate, much lighter, not the same depth of syrup viscosity, but a spicier peppery finish than say the 10 yo. A touch of water expands the flavor, pepper finish and nose but as a personal taste (purely personal) I would prefer a bit more depth and syrup. I would make room for this malt in my whiskey time capsule easy! If you have necer had Longrow before, this is the one to start with. It is an ambassador for the Cambletown (what's left of it) region that represents itsself with style, finess and power. A peaty, briny beauty of a malt, that is surprising in its complexity and a real revelation for me. So Springbank gets the job once again based on this CV! Thank you very much @AboutChoice! I saw from your recent review that the bottle certainly didn't disappoint! A fantastic review as well, it seems we both enjoyed it equally however from different viewpoints, perhaps yours was more an Ecosystem of Gregariousness! As you say, that's the great thing about the site, that we can all share our varying thoughts on the same dram. And indeed the search for new flavours is the never-ending adventure of whisky, sadly have had less time in recent weeks due to work, however am looking forward to picking up the journey again very soon! @markjedi1: thank you very much for your kind comment! i see from your review you're also a big fan of the springbank 10, so will be interested to see what you make of the longrow! personally i'd say it's a notch or two higher in terms of complexity and overall quality. @dbk: i'd definitely recommed it - from reading your Peat Monster review it seems the longrow operates in similar territory, so I think it's one you'd enjoy. Conversely I'm now very much looking forward to trying the Peat Monster! Nose is iodine and some sour cherry fruit. Flavours are muted, some bright fruitiness at the start, moving toward little peat, little malt, little wood (the General Arts degree of Scotch). Spicy oak finish. This is one of the Springbank whiskeys that I had a change to taste at the distillery. This one has a very butter scotch nose. There is a hint of peat to come, like smoke in the fall air. After a taste this smokiness rounds on your taste buds. That is why I bought a bottle of it at their store and brought home.